Yes, it's The Word Spy Activity Book. YOU get to write, draw and have fun with The Word Spy! I'm back again with a brand new book. Yes, it's The Word Spy Activity Book! You might have read The Word Spy and The Return of the Word Spy. This one is different because now YOU get to write and draw in it as well. It's full of new discoveries, crazy games and playful puzzles, which all have one thing in common: WORDS! Inside the pages of this book you'll meet the mad word inventor, put on a shadow puppet play, learn how to solve cryptic crosswords, make up your own bingo lingo, create your own font – oh, there's just so much, you'll just have to open it up and find out for yourself! 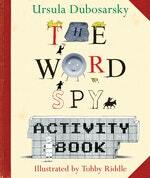 Love The Word Spy Activity Book? Subscribe to Read More to find out about similar books.